Powers/Abilities: Earthquake possesses the abilities to generate seismic energy projections that create tremors beneath the surface of a planet. He can direct these projections into a person or a structure as well, and propel the debris from his blasts directly at an opponent. Earthquake likely possesses super-dense skin. Earthquake has used a Shi'ar anti-gravity device to fly. It is unknown if his abilities are possessed by his entire race or solely by him. The full extent of his abilities are likely unknown. (X-Men I#137) - Lilandra sent the Imperial Guard against the X-Men (Angel (Warren Worthington), Beast (Henry McCoy), Colossus, Cyclops, Phoenix, Storm, Wolverine) on the moon to give the Shi'ar rights to slay the Phoenix. If the X-Men won, the Shi'ar would leave the Phoenix to them. A massive battle broke out and the Imperial Guard soon won. Guard members in this mission: Earthquake, Gladiator, Hussar, Manta, Oracle, Smasher, Starbolt, and Warstar. During the battle, Earthquake collapsed the floor beneath Storm and Wolverine and fired debris at them. Storm blew the debris back until Hussar distracted Storm with her neuro-whip, then Earthquake knocked Storm out with more debris. He later aided Hussar and Gladiator against Phoenix and Cyclops, but Phoenix committed suicide. (X-Men: Spotlight on Starjammers#2) - At Deathbird's orders, a large group of the Guard attacked the Starjammers (Ch'od, Corsair, Cr+eee, Hepzibah, Raza) and Excalibur (Captain Britain (Brian Braddock), Lockheed, Meggan, Nightcrawler, Shadowcat, Phoenix (Rachel Summers), Widget) on Earth at Deathbird's orders, but they were ordered to retreat when Deathbird was put at risk. During the battle, Earthquake was punched by Ch'od then waylaid by Shadowcat. Guard members who participated in this assault: Astra, Black Light, Blackthorn, Earthquake, Electron, Gladiator, Hobgoblin, Impulse, Magik, Mentor, Midget, Nightside, Oracle, Smasher, Starbolt, Tempest, Titan, and White Noise. (Uncanny X-Men#275) - The Imperial Guard was attacked by a group of Warskrulls posing as the Starjammers. The Guard seemed to be winning until the X-Men (Forge, Gambit, Jubilee, Psylocke, Storm) joined the fight against them, and the Guard was quickly overwhelmed. Guard members in this mission: Earthquake, Gladiator, Mentor, Oracle, Smasher, Starbolt, Tempest, Titan, and Warstar. (Thor I#446) - Members of the Imperial Guard tended to Lilandra on Chandilar, standing guard as she met a delegation of Avengers (Captain Marvel (Monica Rambeau), Living Lightning, Scarlet Witch, Starfox, Thor (Eric Masterson), Wonder Man). The Kree Starforce (Korath the Pursuer, Ronan the Accuser, Shatterax, Supremor, Ultimus) attacked and the Guard teamed with the Avengers to defeat them. During the battle, Earthquake guarded Lilandra. Ultimus attacked and Earthquake tried unsuccessfully to hit him with debris, but was soon knocked aside. Lilandra was saved by Starfox, then she defeated Ultimus herself. (Avengers West Coast#82) - When the Avengers resisted Lilandra's edicts, the Guard attacked them. During the battle, Earthquake was hit by Thor and avoided Living Lightning's blast. 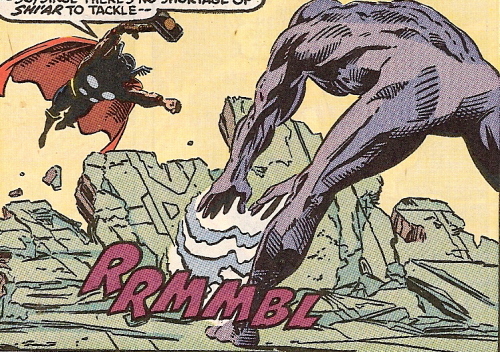 He hit Thor with a seismic shock, but Thor flew through the debris and wrapped Earthquake up in the floor. 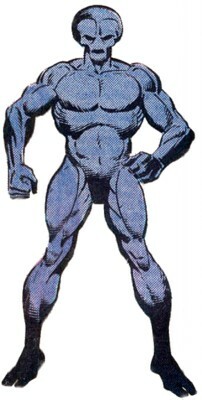 The battle ended when Araki was exposed as a Skrull imposter. Lilandra rescinded her orders and called the Nega-Bomb back. Members of the Guard in this (and the prior) mission: Astra, Earthquake, Hardball, Hussar, Smasher, and Titan. (Imperial Guard#1 (fb) - BTS) - Lilandra sent eight of the Guard to Earth to watch out for Kree militants and to protect the planet in the absence of its heroes (many of whom had been seemingly killed by Onslaught, a composite entity of Professor X and Magneto). Members on this mission included: Commando, Earthquake, Electron, Flashfire, Gladiator, Mentor, Nightside, and Oracle. They aided the Avengers (Black Widow (Natasha Romanova), Hercules, Quicksilver) against Primus and his People's Underground Militia. During this battle, Earthquake remained behind on the ship, feeling resentful. (Imperial Guard#1) - After some down time, Earthquake informed the Guard of the Militia's whereabouts, and joined them in battle, wearing an anti-gravity device to allow him to fly. During the battle, Earthquake was hit by a large blast in the back. The Imperial Guard were defeated this time. (Imperial Guard#2) - The Guard escaped and Earthquake checked on Nightside to make sure she was okay. They soon learned the Militia were Kree operatives. They fought the villains again, and helped authorities clean up after the villains escaped. (Imperial Guard#3) - While tracking the Militia again, the Guard discovered that the Kree planned to detonate a Nega-Bomb. When Flashfire spoke out against all Kree, Earthquake worried about Commando's feelings being hurt. Despite their protestations, Gladiator sent Oracle, Nightside, and Earthquake to round up the runaway Militia while they tended to the Bomb. After a deadly battle, they managed to stop the bomb from going off and defeated the Militia. They allied with Rick Jones (who'd been powered by the Supreme Intelligence) and learned the Supreme Intelligence was on Earth. (Inhumans IV#4) - Lilandra represented the Shi'ar Empire on the planet Kritnah in the marriage ceremony with Emperor Eson of the Spartoi while the Imperial Guard stood by. Black Bolt moved to attack Lilandra, who set up a shield and activated the Guard against the Inhumans. Black Bolt screamed, seemingly slaying Lilandra. The Guard moved in at full force. Astra appealed to the Inhumans, asking them if they knew what they'd done and what the consequences for the universe would be. The Inhumans teleported away, escaping. Lilandra's form was revealed to be Hobgoblin, who appeared to be dead. Lilandra, as a hologram, revealed herself and told the Spartoi that the union was off due to their atrocities. Jason of Sparta was blamed for being behind it. Members of the Guard in this mission: Astra, Delphos, Earthquake, Fang, Flashfire, Gladiator, Hobgoblin, Hussar, Impulse, Mentor, Neutron, Nightside, Oracle, Smasher, Starbolt, Titan, Warstar, and others. (Thanos#12) - Earthquake and Astra picked up Gladiator and new recruit Peter Quill from the Kyln. Earthquake was put off by Quill's strange attitude and humor, and thought recruiting him was a mistake. Earthquake later helped evacuate the sector of space that was in danger from the battle between the Fallen One and Thanos. (Uncanny X-Men#485) - Members of the Guard stood guard at the wedding of Deathbird to Vulcan, D'ken acting as new emperor having ordered it. The X-Men (Darwin, Havok, Marvel Girl (Rachel Grey), Polaris, Warpath), Starjammers (Ch'od, Corsair, Cr+eee, Hepzibah, Raza), Korvus, Lilandra, and the armies of General Ka'ardum attacked, and the Guard fought against them. Earthquake briefly fought Raza. Vulcan then assassinated D'ken. (X-Men: Emperor Vulcan#4) - Vulcan summoned the Imperial Guard (Earthquake, Gladiator, Starbolt, Titan, Warstar) to defend him against the Eldest, leader of the Scy'ar Tal. The Eldest chided the Guard for serving their Shi'ar enslavers and easily defeated most of them, seemingly killing Earthquake. (X-Men: Emperor Vulcan#5) - Earthquake lay seemingly dead. (War of Kings#1) - Vulcan surveyed, with Gladiator, the assembled Imperial Guard. Mentor reported they were all battle ready and Vulcan announced his intentions to attack the Kree. They soon engaged in a massive battle with the Inhumans and Starjammers, successfully capturing Lilandra before retreating. During the battle, Earthquake unleashed his powers on a Sentry. Members of the Guard in this mission: Astra, Black Light, Earthquake, Electron, Fang, Flashfire, Gladiator, Hussar, Impulse, Magique, Manta, Neutron, Nightside, Plutonia, Schism, Scintilla, Shapeshifter, Smasher, Squorm, Starbolt, Titan, Voyager, Warstar, and White Noise. (Realm of Kings: Imperial Guard#1) - When the planet of Izumbard refused to create more warships for the Shi'ar, the Imperial Guard (Earthquake, Electron, Flashfire, Neutron, Plutonia, Titan, Voltar, Warstar) were sent to quell the riots. In the ensuing fight, Electron turned the weaponry back on the Izumbard and Voltar was killed. Another branch of the Guard (Commando, Fang, Gladiator, Hussar, Manta, Starbolt) soon arrived to aid in the battle. Later, at their barracks, they proposed a toast, and Manta recognized the loss of Voltar. A fight broke out and Earthquake was about to get involved when Mentor, Smasher, and Oracle interrupted the fight. Mentor told them that some of them had just volunteered for a special strike force mission due to their bad behavior. Earthquake has a partial entry in OHotMU Deluxe Edition#6. The Imperial Guard was a takeoff of DC's Legion of Super-Heroes --Earthquake is based off Legion Of Super-Heroes reject Quake Kid (@ Legion of Super-Heroes#218 (August, 1976). Earthquake was also one of the Imperial Guard members active in the novel X-Men: Empire's End by Diane Duane. It has to be seen if this story is canon.